In the new issue of integration, Joachim Schild analyses Emmanuel Macron’s European policy approach with a special focus on the role of Germany to support its implementation and the opportunities of a strong and reenergised German-French co-leadership for the Union. Stefan Schieren traces the development of the multilayered relations of constitutional, political and European factors that are crucial for understanding the current debate on Scotland’s future relations with the EU and evaluates the chances of Scottish independence in relation with Brexit. The thematic focus “flexible EU” in the current issue covers different aspects of differentiated integration. Political proposals and scientific concepts of flexible integration are presented and categorised according to their potential for integration/disintegration. Linked herewith is the question to what extent flexibility fosters or endangers coherence of the EU. In addition, the issue examines whether flexibility can play a role in strengthening Economic and Monetary Union and how this has to be organised in order to avoid negative consequences of flexible integration. It also contains information on the ninth German-Nordic-Baltic Forum and the ‘Arbeitskreis Europäische Integration’ reports on conferences about trade defence instruments and public finance. The French presidential elections open a window of opportunity for French European policy and for the European Union. Against the rising tide of Euroscepticism in France, Emmanuel Macron was able to win this electoral contest with an openly pro-European programme. He tabled an ambitious, proactive European policy approach, including reform proposals for key policy areas, and promised a “refoundation” of Europe. These proposals are combined with “protective” elements to assuage the widespread French fears of globalisation and European market integration. Two conditions must be met in order to implement his plans and restore French influence within the European Union: successful social and economic reforms at home and a strong and reenergised bilateral relationship with Germany in order to provide co-leadership for the Union. There has been a connection between Scottish independence and Europe for decades. In 1988, the SNP introduced its slogan “Independence in Europe”. However, recent constitutional, political and European developments led to the present situation that connects Brexit and the break-up of Britain in a way, one would not have thought of ten years ago. Considering these multilayered relations is crucial for understanding the current debate on Scotland’s future relations with the EU. The article reviews the process of devolution and concludes that Brexit made Scottish independence rather unlikely. The article categorizes political proposals and scientific concepts of flexible integration using a twodirectional and multidimensional concept of EU (dis-)integration. 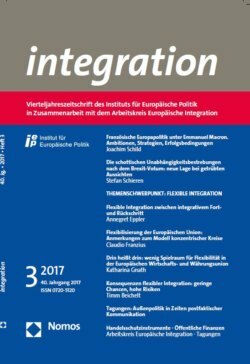 Causalities for (dis-)integration assumed by the theories of European integration – interests of EU states on the one hand and interdependencies between integration dimensions on the other – are applied to the formation of flexible integration. Using these two basic explanations, the article takes existing studies as a basis to discuss theoretical causalities and empirical cases in which flexible integration may lead to further integration or disintegration of the overall EU system. Various models have been proposed to make the European Union (EU) more flexible. The Brexit makes the model of concentric circles attractive, but it remains unsettled how such a flexibilisation can be embedded in the political structure. If we refrain from strong conceptions of unity, then the crucial question is how to ensure the coherence of flexible structures. This article argues against the idea of two circles which would require member states to choose the inner circle of the Eurozone so as not to be “deported” into the outer circle of a mere partnership. The euro crisis has shown that the common currency has major design flaws. Therefore, efforts have been made in recent years to strengthen the institutions of the euro area and to better prepare it against future crises. Emmanuel Macron, who won the French presidential election in May 2017, has announced that he will join forces with Germany and the other euro area countries to launch further integration steps to stabilize Economic and Monetary Union. This article, entitled “In means in: Little scope for flexibility in Europe’s Economic and Monetary Union”, examines whether flexibility can play a role in strengthening Economic and Monetary Union, and if so, in what form. It comes to the conclusion that flexibility cannot mean that some Eurozone members participate in the reform process of the euro area while others do not. The only acceptable form of flexibility is the deepening of the Eurozone through intergovernmental treaties outside the EU legal framework. However, it must be ensured that the mechanisms of parliamentary control and accountability enshrined in the European rules are not undermined. Flexibility within the EU is often judged as a possibility to foster integration and to overcome stagnation. This text in contrast takes a more pessimistic position and argues from a theoretical and empiric perspective that many forms of differentiated integration would go at the expense of peripheral member states. It is also argued that empiric examples of selective integration have not shown convincing results. Consequences of flexible integration are therefore generally judged as ambivalent.